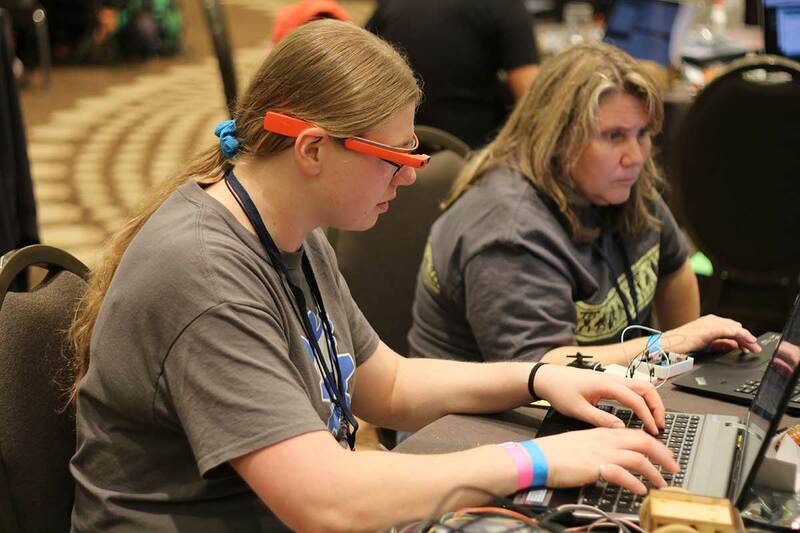 RobotsConf, a new conference designed to transform coders into makers, was a huge success! I spoke with conference curators Chris and Laura Williams before the event. They had an audacious plan, and I wondered if it would work. I’ve attended many tech conferences and maker events, but never one with this format – a format which was later referred to as “sleep-away maker camp” by an attendee. Over two days, web developers were inspired by @Whurley and Super Awesome Sylvia, educated by a number of talented workshop guides, then set free in a build area with over 50 drones and all the parts to build SumoBots and other interactive devices. With 16 hours of build time (more for those that refused to sleep! ), attendees learned, explored, built, and demonstrated their robots. I watched teams form dynamically, with piles of parts gathered on their conference table for inspiration. Teams created SumoBots, robots that responded to web forms and twitter messages, robots controlled by Leap Motion, robots powered by the new Spark Core, robots with 3D printed catapults that shot candy, flying drones that lifted and dropped objects, a 3D printed boat with an Arduino that was tested in the swimming pool, an airboat made from beer bottles and a 3D-printed propeller, and much, much, more. I can only imagine what the attendees would have created with another day, or even a week together. In fact, I’m pretty sure that with a week together at least one crowd-funded product would emerge. Attendee feedback was overwhelmingly positive, praising the speakers, the educational content, the format, and the gender diversity of the event. 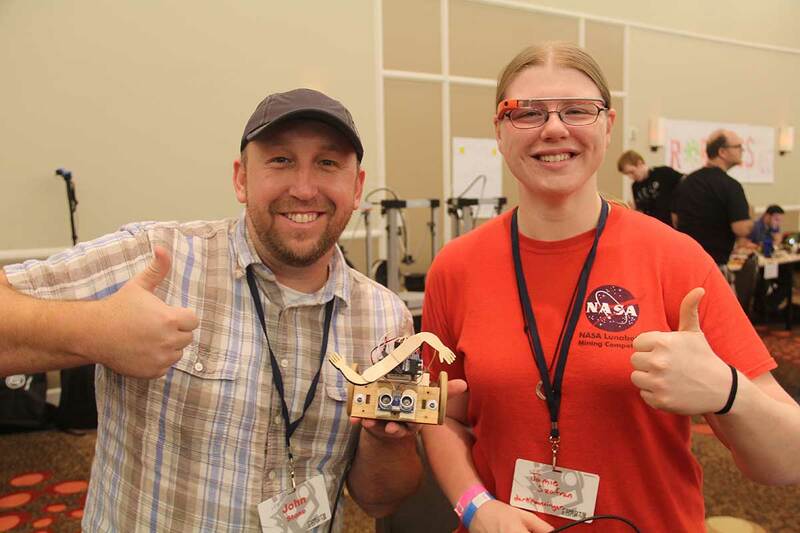 I featured attendee Jamie Szafran before RobotsConf, and I reconnected with her after the event to get her perspective on the RobotsConf experience. 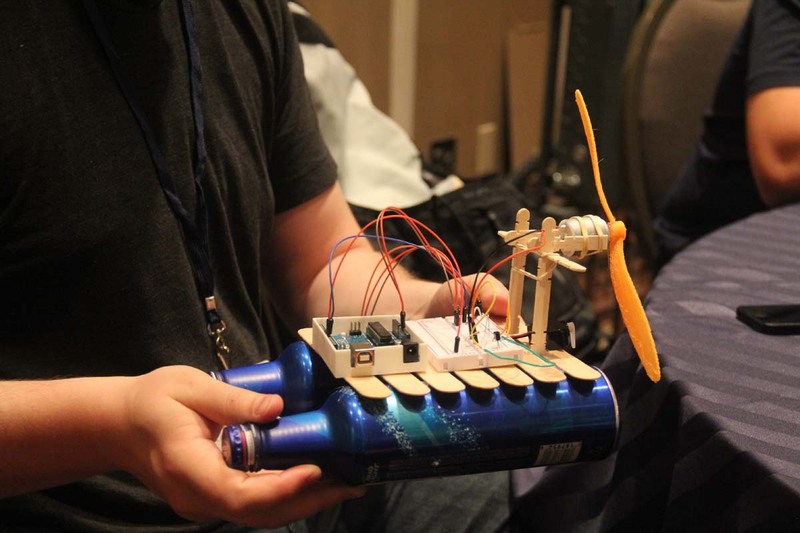 What did you learn at RobotsConf? To answer in a broad sense, I learned of a lot of possibilities for creating and making things, both from attending the talks and from seeing all the hardware, projects, and ideas of the people around me. Do you have any good stories from RobotsConf? Well, the first one that comes to mind is just how late I was up Friday night – after the first open hack session, I was feeling a little behind, because I’d taken my time getting a team together and figuring out what to do. We’d also had some trouble getting the robot body to stay together and sound; the nickname “DerpyBot” stuck after the thing ended up lopsided with a crooked wheel. So after they’d closed up the temporary hackerspace for the night (1am), I went up to my room to work for “just a half an hour” finishing writing a library. I got to bed at 4:30… I’m pretty sure I had a Hershey’s and caffeine hangover the next morning. What have you been making since you returned home from RobotsConf? I’ve been making holiday presents! I can’t tell you what they are since the recipients might see this before they get their presents, but they involve music, lights, LilyPads, motors, and other fun components I’ve never used before; it’s been an all-around learning experience for me… and for the friends helping me get it all together. Will you attend RobotsConf next year? I’d like to! :) It felt like this year went by too fast – I wasn’t ready to go home quite yet. I’d like to thank all those that let me follow them around at RobotsConf, taking pictures and asking them lots of questions. I’d also like to thank Chris and Laura Williams for the passion and determination it took to make RobotsConf a reality, and allowing 150 software developers to experience the joy of making. I’m sure we will see those developers at a Maker Faire in 2014!